I definitely gravitate towards more classic styles & silhouettes – navy stripes have been seen repeatedly here on PPF and will always be a closet staple for me. So, it seemed only fitting to wear this new nautical-inspired blouse with a bright red blazer for an all-American vibe. But to keep the look from feeling stuffy, I paired them with slouchy boyfriend jeans, slightly edgy white heels & piled-on gold jewelry. 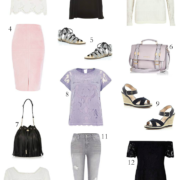 What are some of your favorite ways to balance out classic pieces in your wardrobe and make them look modern & fresh? I am obsessed with stripes, it is a definite must have in my closet aswell!! Love how you paired the top with the red blazer!! Love this classic color combination and your amazing shoes! Really beautiful look on you. Lovely outfit! I like your shoes and blazer very much! I totally agree with gravitating to red, white and blue- nautical styles. I can't get enough of it. It's timeless and classic. Such a classic look! 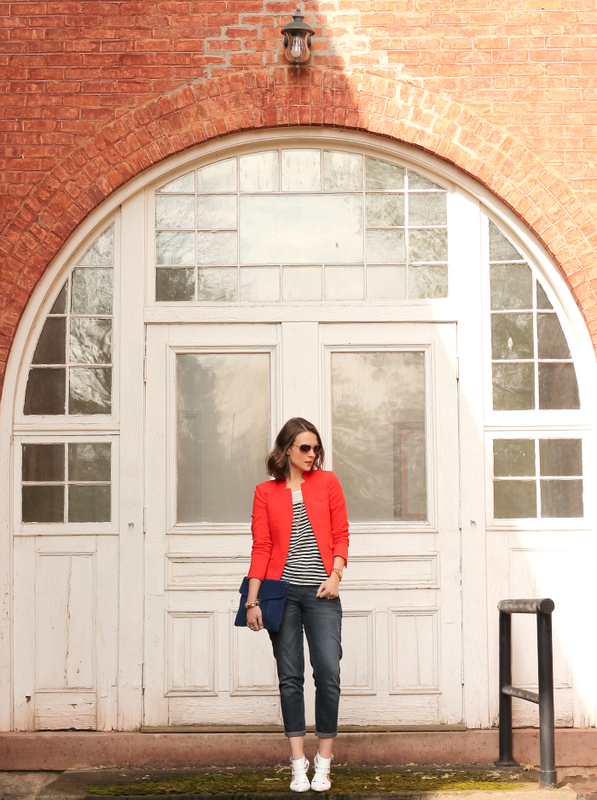 I have been looking for a red blazer for a while, and this one would totally fit the bill! Love that the shoes add a different element to this outfit! Love it! The heels look like they would kill me but you wear heels more than I do. Love that first picture… gorgeous!! And, adore this look, particularly the clutch; that soft navy looks so gorgeous. Definitely my favorite detail though stripes and gold are always homeruns for me! Love this summery look! And those shoes look so much more expensive! This is such a classic look but I love the twist with those awesome heels. Ahhh!!! I love that red blazer- those shoes are definitely a piece to edge up the look! I gravitate toward statement necklaces or shoes to add flare to a traditional look! How beautiful is that door back there, I mean really! Head over heels for those shoes! Look at those heels!! 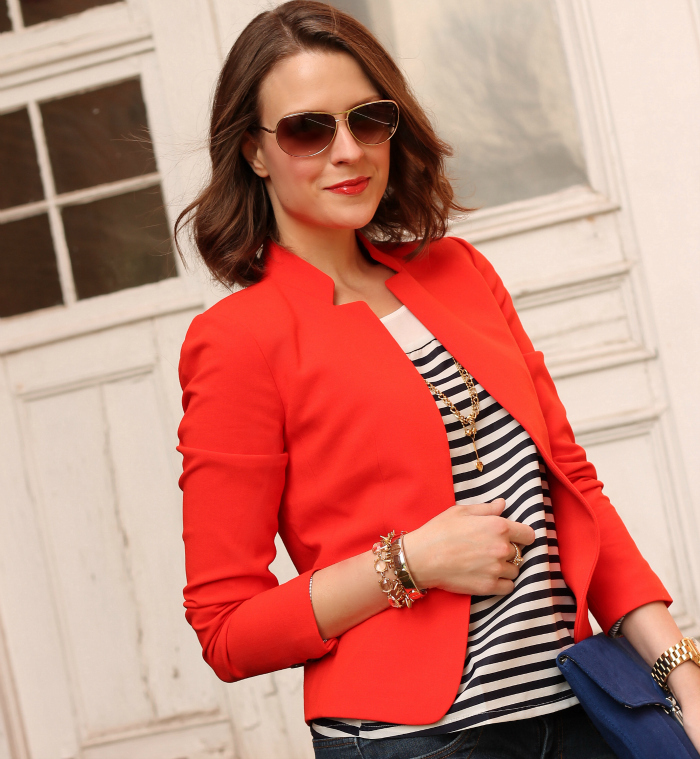 Love the all American striped, navy and red look! So chic! Hope you are having a wonderful day! Love this nautical inspired look!! 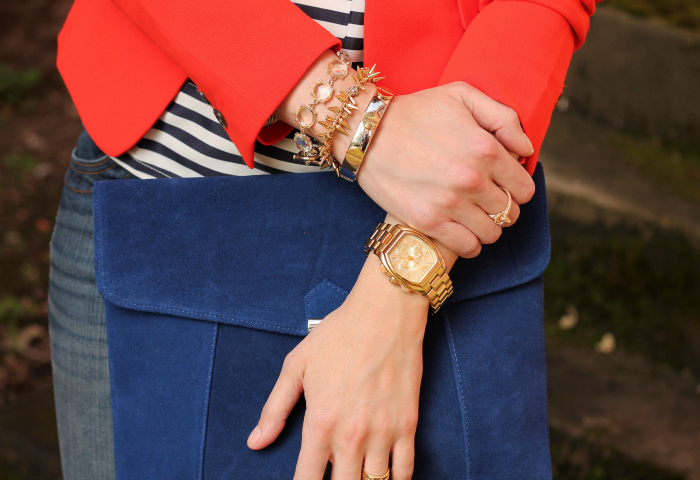 Love navy strips and a red blazer. Such a classic nautical look, perfect for summer! Adding the bold color definitely keeps things fresh! Love this classy look. Your style is always just the right combo of interest but simplicity…love that! Obvi I love the navy stripes + red. That's my everyday go-to! Gorgeous photos too! you look like a perfect casual/dressy combo here! kw Ladies in Navy Target giveaway! Loving this look.. especially those shoes!! And I love your background.. SO gorgeous.. where is that?! 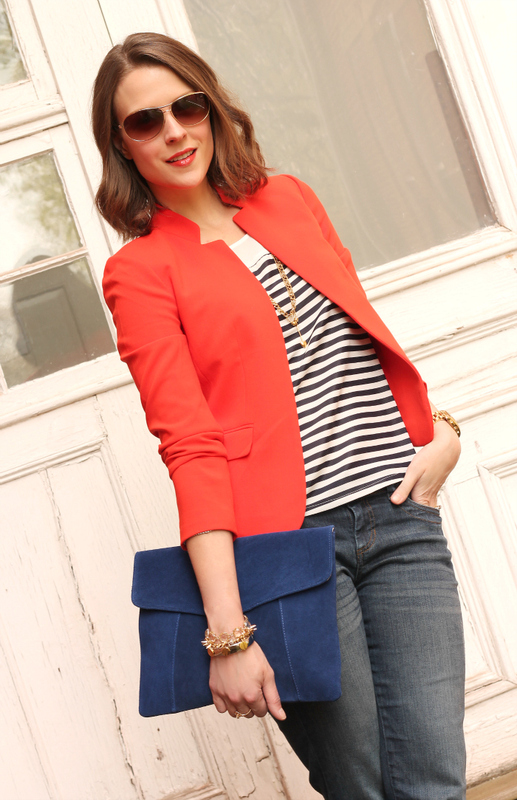 I love the navy stripes when that striking red blazer. This would be a perfect look for July 4th! The stripe/blazer combo is a classic for a reason. And you're totally rocking it! I have a sick obsession with navy stripes 🙂 But ya know, they will just never go out of style! I like the classical take on a nautical look. Your striped shirt and red blazer are my favorite pieces. Loving all of Stella and Dots new collection! Loving that red blazer and those heels are so fierce! 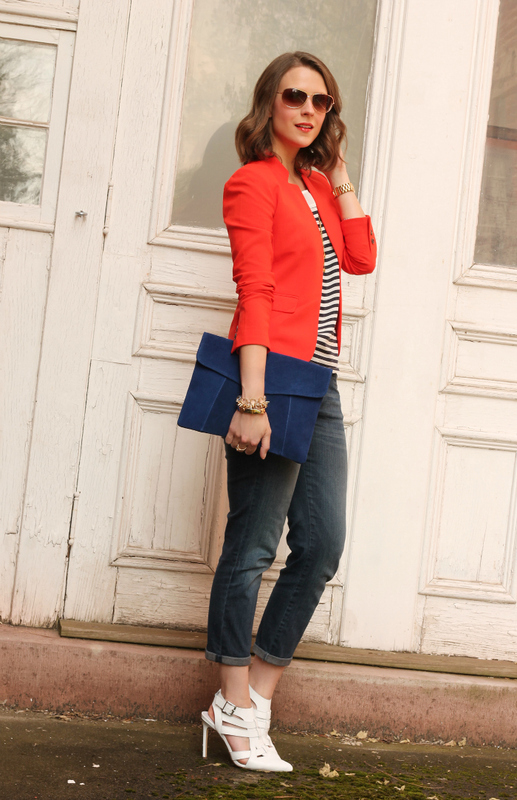 I'm wearing navy stripes and red on my blog today too! Gorgeous outfit! Perfect colors mix! Wow,amazing post…I really like your blog.^^ Maybe follow each other on bloglovin? I am a total stripes addict but honestly I am not sure if I have a plain navy and white striped shirt. Crazy right? MIght have to get this one! PS Giveaway on the blog today — 3 rose gold knuckle rings! Did you cut your hair? It looks really pretty! Such a classic and feminine outfit. Those shoes are such an amazing piece! Love how you kept it simple with them. Loving everything about this outfit! That blazer is awesome! Love stripes as well, and those heels are gorgeous! I think accessories are a great way to freshen up a classic look.